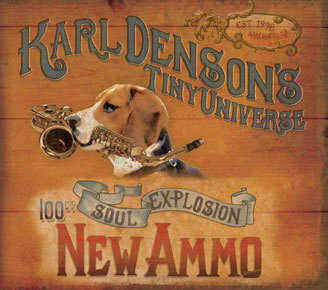 Good luck coming up with a category for New Ammo, the first record for Karl Denson’s Tiny Universe in five years. The buffed-up octet tosses together the driving grooves of Phish-like jam bands, the itchy spasticity of Downtowners like the Lounge Lizards and James Chance, and the splash-and-stab horn charts and kick-drum funk of James Brown. Twenty years ago, Denson was playing his originals (and a Dexter Gordon cover) on tenor saxophone in a trio with Jack DeJohnette and Dave Holland. But most of the “jazz” on this new disc comes forth in the arrangements and genre transitions. Danceability is the paramount concern.